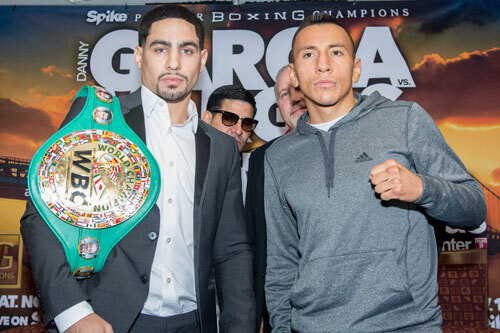 WBC welterweight champion Danny "Swift" Garcia, 32-0, 18 KOs, announced that he would fight a 10-round non-title bout against Canadian-based Columbian Samuel Vargas, 25-2-1, 13 KOs, on November 12th at the Liacouras Center. The announcement came at a press conference at the venue complex, which is located on the Temple University campus in North Philly. Garcia, a multi-champion in the 140 pound division, moved up seven pounds to welterweight class, and won the WBC belt in January with a 12-round decision of Robert Guerrero. The fight with Vargas will be Garcia's first fight since winning that title. Vargas is on a 5-bout winning streak, and is trained by Philadelphian Billy Briscoe. 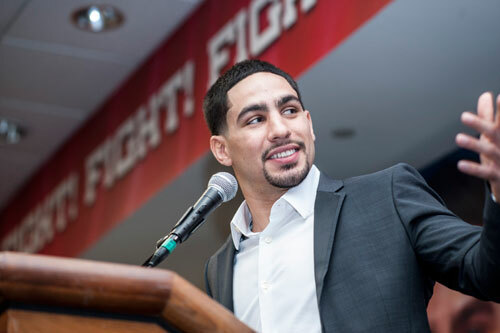 Garcia will also use the opportunity of his first hometown fight since 2010 to give back to the City of Philadelphia by partnering with Philabundance, the regions largest hunger relief organization. Fans are encouraged to drop off canned goods at the Liacouras Center (1776 N. Broast St.) and the DSG Boxing Gym (3731 Jasper St.). Also a portion of each ticket sold to the Nov. 12th fight will be donated to the cause of hunger relief. The exciting 9-bout show is promoted by Marshall Kauffman's Kings Promotions and will be televised nationally by Spike TV. Also on the card is a terrific 10-round, 130-pound match-up between Wilmington's Omar Douglas, 17-0, 12 KOs, and former WBA champion Javier Fortuna, 30-1-1, 22 KOs. Fortuna lost his title to Camden's Jason Sosa in June, and should provide a great test for the undefeated and quickly rising Douglas. Philadelphians Milton Santiago (15-0, 3 KOs, jr. welterweight), Antonio DuBose (8-1-1, 2 KOs, jr. lightweight), Naim Nelson (13-2, 1 KO, jr. welterweight), and T.J. Velasquez (5-0, 4 KOs, jr. lightweight) will also see action on the show. Velasquez will fight Philadelphian Gerald Smith (3-2, 1 KO). Once-beaten Kyrone Davis (10-1, 4 KOs) of Wilmington faces Cleveland's Chris Fitzpatrick (15-5, 6 KOs) in a 6-rounder. 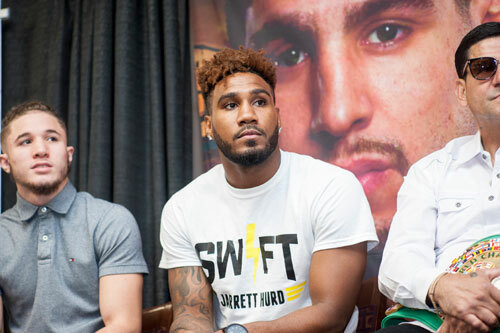 The televised portion of the card will begin with a scheduled 12-round bout between undefeated jr. middleweight Jarrett Hurd (18-0, 12 KOs) of Maryland against Mexican Jorge Cota (25-1, 22 KOs). Omar Douglas vs. Javier Fortuna will also be televised prior to the main event. 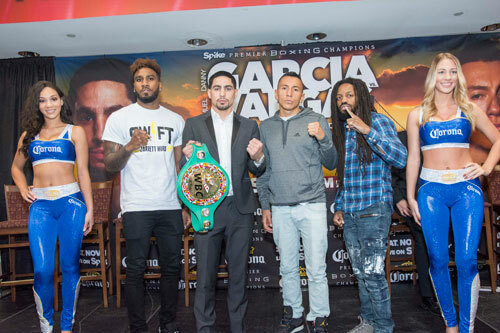 Garcia's bout is expected to be his last stop before taking on WBA welterweight champion Keith Thurman in a highly anticipated unification fight during the first quarter of 2017. 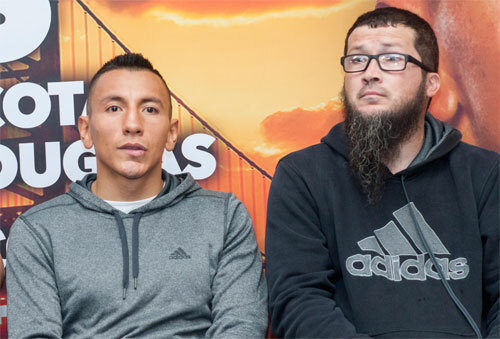 "My dad and I wanted to get one more fight in before the end of the year and there was no doubt in my mind it had to be in Philadelphia," said Garcia. "My team got it done and it's a great feeling to fight at home over the holidays. I'm excited to use this opportunity to give back to the community and put on a show on November 12. This city means everything to me. I hope everyone comes out, but shows up with cans of food too. I'm gearing up for a big fight with Keith Thurman next year that's going to be a can't miss event. 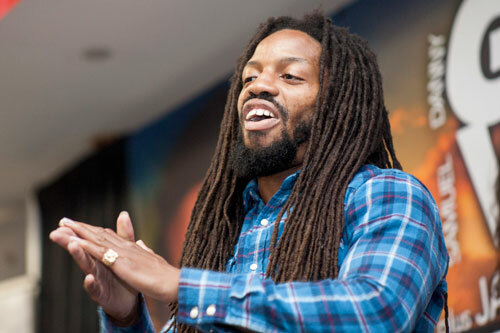 First, I'm going to fight for my city on November 12." "Things happen when you work hard and I'm so excited about this opportunity," said Vargas. 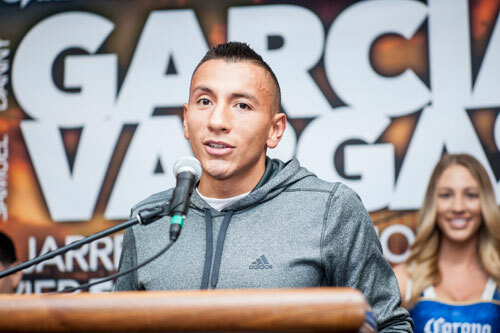 "Garcia is a great fighter and he cleaned out the 140-pound division and now he is champion at 147. A win would change my life and everyone around me. This is my time. I can't fail. This is going to be a Rocky story in Rocky's town." Tickets, priced at $200, $100, $75, $50 and $35, are on sale. To purchase tickets, visit www.LiacourasCenter.com/events or call 800-298-4200.